I don’t actually know any woman who doesn’t like to shop at least some of the time. If you can’t stand shopping for clothes, you might like shopping for food. If you loathe shopping for furniture, you might like trying on shoes. Shopping, window-shopping, browsing—whatever you call it—can be a drug. We have the ability to immerse, no, lose ourselves in that adorable clutch with the bead work or those sweet little striped espresso cups or that cute little bargain thingy—even if we don’t need it or want it. Have we ever asked ourselves: Why are we shopping when we have a closet full of shoes or a perfectly good carpet in the living room? What are we sad about in the first place? Are we even aware that we’re feeling down? Sometimes we medicate our symptoms of being human by eating, reading junky novels, or, you guessed it, shopping. And why is shopping a “loneliness loop”? Why do so many of us shop, mindlessly, when we really don’t need anything at all, at least nothing money can buy, and we know we’ll feel lonelier or sadder afterwards? 1. Shopping might be replacing a relationship with others. When we shop, we’re spending time in a non-threatening, lightweight-relationship with our surface self. 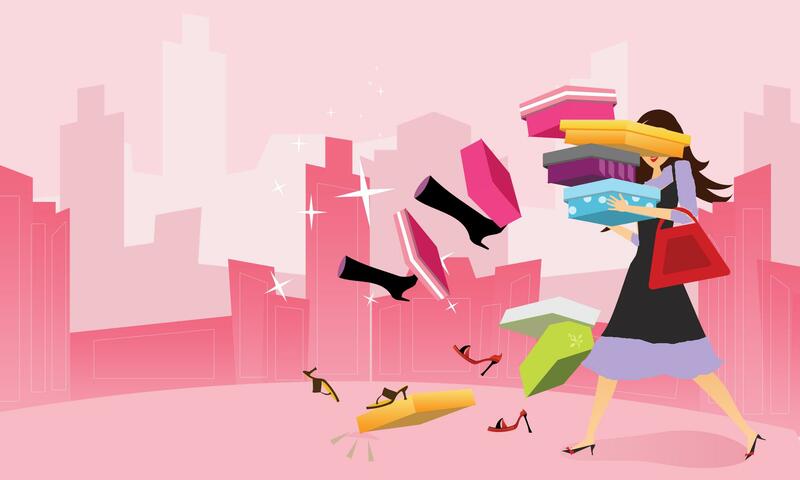 Shopping soothes the pain of more challenging relationships. It’s just so simple: Stuff, meet Self, Self, BUY! 2. When we shop we enter a zone of narrow focus—hunting for the perfect shade of green soap dish for our bathroom, for example. Like any sport or intense activity, we don’t have the head-space to think about our how our lives are going or where we’re headed in big-picture terms. We don’t have time to think about Soul, Faith, Love, God. We’re in the zone. 3. Maybe we shop because we believe others judge us by or value us for our possessions—this designer, that designer. This brand, that brand. And so on. And we care too much about how others perceive us. 4. And maybe, secretly, we judge or value ourselves this way, too. Our self-worth is bound up in our possessions (we aren’t happy with the six-year old Toyota, we feel that somehow a new Lexus will make us more…something). 5. We have a hole inside us, and we’re trying to fill it. That hole may very well be our relationship with God. Rebbe Nachman of Breslov says: A person should always feel contented with what [she] has. Of course, most of us know this. We realize that true wealth is being happy with whatever you’ve got. But the Rebbe means something deeper. He’s saying that we have to believe that whatever we’ve got (whether it is our body or a “thing”) is from God. All of it. Even our less-than-perfect nose, our parents, that saggy sofa—even that perfect-shade-of-jade-green soap dish that sits on our sink. God is the source of everything. If we’re meant to have it, we’ll have it. If not, we won’t. But, Rebbe Nachman also tells us to not take too much from this world, no more than we truly need. Now, that doesn’t mean we need to be an ascetic. But it does mean we need to think about how we use the money—which is like a chunk of our lives since we spend part of our life working for it—we have. We also have to think about the time and the space we have. How do I use my time-bank-account? Am I spending my time building strong relationships with the people that are important to me? Am I spending it reaching out to others and connecting with them in meaningful ways? Am I using it getting to know myself better by spending some amount of time in meditation and prayer? Am I using it to move closer to God? Am I using my time to fulfill my life’s purpose? Am I aware of the spiritual power of time? Am I filling that space with people who are important to me? Am I inviting people to my home who could benefit from being here, maybe offering a hot kosher meal and sharing words of Torah? Is my home a space that children can be happy playing, learning, and growing in? Do I have an empty space (a corner, even) where I can be alone and meditate and pray and do I make use of it? Do I fill my home with holy books, uplifting music, and other things that help me achieve personal growth? Do I have the material things I need in order to do mitzvahs, such as pans in which to bake challah, a prayer book, Shabbos candlesticks, or a beautiful Shabbos outfit complete with jewelry? Is my home a space where I’m comfortable, but not necessarily cossetted and strait jacketed? Do I own my stuff or does my stuff own me? Do I freak out if my child spills grape juice on the rug? Or, is it a space in which a child (or an adult!) can feel comfortable being creative and happy? Am I aware of the hidden spiritual nature of my living space? If you need some time to cut loose and relax but you don’t really need another pair of earrings, try a walk outdoors, hisbodedus (prayerful meditation), or challah baking. And when you do choose to do some recreational shopping, rather than “pass the time”, you might want to make it more about connecting: invite a friend to join you or buy a present for someone else. *I love the feeling and look of various textiles, embroidery, threads, woolen yarn, and so on, but I don’t knit or even sew. Yet, I have purchased all these items at points in time for their sheer beauty.